What type of dog should you have? Designer Dog Breeds: What are they? What is a Puppy Farmer? Selecting a puppy: How do you choose which one to have? What is good temperament in dogs? Health Tests – why bother? Want to buy a dog? How do you do that? How much exercise should your dog have? Vaccinations – When should you vaccinate your dog? Neutering: When should you neuter your dog? Obsessive behaviour – when is it a problem? Aura is such a joy, constantly loved and admired by absolutely everyone, especially young children and people who train dogs for a living! She has an amazing temperament, so cuddly and tactile. Aura adores people, especially children and knows that everyone thinks she is marvellous (well most people do). 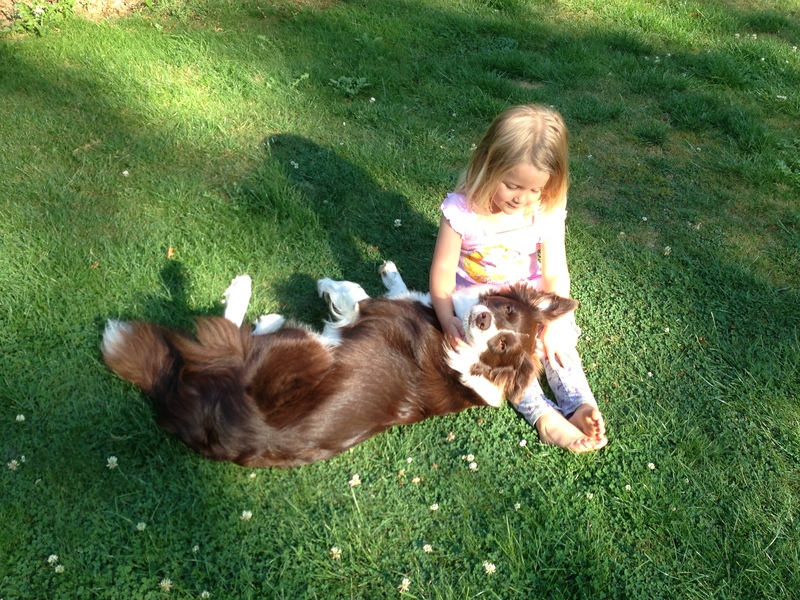 Aura is very bright, (even for a border collie) and very keen to work. Her teachers love her because she ‘gets it’ really quickly and wants to have a go; she loves agility! She won a pre-beginners class in obedience at just a year old, but we now just focus on agility, as it is much more fun. I am very proud of the progress Aura has made in agility, as she won into Grade 4 in September 2017 and has had a number of other rosettes this year, including another win. I am excited to see what progress she will make in future. In April 2016, Aura produced a beautiful litter of puppies, the A-Z Litter. They have grown into wonderful adult dogs, see testimonials. Unfortunately in January 2017 Beck (pictured) had a series of epileptic fits and was subsequently diagnosed with idiopathic epilepsy. ‘Idiopathic’ means ‘of unknown cause’, which means that it may or may not have a genetic component. Epilepsy remains common in a number of breeds, including collies (around 3%), but just as for humans, the cause remains difficult to pin down. Obviously this has been very upsetting, as I take the health of my dogs extremely seriously and do everything I can to breed healthy dogs. I spoke to the Animal Health Trust in Newmarket, who are doing research into Collie Epilepsy. They told me that “despite extensive research and the accumulation of a large quantity of data, no clear genetic link can be found for dogs with epilepsy.” Despite this assurance, I will not be breeding from Aura again. Unfortunately the owner of the stud dog has used him again for breeding, which is very disappointing, in my view. This condition normally develops between one and four years of age, so we know that Luna’s first litter have not developed epilepsy and there is no sign of the condition anywhere else in these lines. As with humans, epilepsy can be manageable and dogs can live happy lives for many years. Unfortunately Beck’s condition could not be managed through medication and she was put to sleep at the end of August 2017. Rest in peace little girl. I have continued to breed, because I do everything I can to produce healthy dogs with good temperaments, but I am breeding from a different line. If you have any queries or concerns, please get in touch? Having lived with and lost a dog to epilepsy I applaud your actions regarding your border collie and wish there were more breeders following your example. Although the AHT have no scientific evidence that genetics are involved I feel convinced that it is only a matter of time before its discovered. The trauma of watching a much loved dog suffering continuous seizures and having no means to help never leaves you. I love this breed, they are amazing but I’m not ready to risk an experience like that again, even after four years. I have studied the BC Fitting Database and there are many dogs from the same lines that are epileptic which surely cannot be coincidental. So thank you for your responsible actions…there will be a few less. Fundraising: CALENDAR 2019 – BUY NOW!